See what one more star in an on-line review can do for your sales. 5 Star Reviews. Why care about 5 Star Reviews? 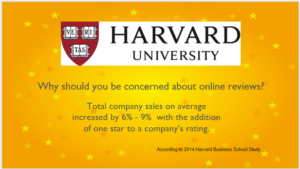 A recent Harvard University Study shows that just one more star in an on-line review can be worth as much as 9% more sales. The question is not only What are you doing to earn that star, it’s also How easy is it for your customers to leave that review? You know that once your customer leaves your office or store, the chances of getting any review drop. A lot. So, CellCon Consulting is pleased to announce our partnership with 5 Star Marketing. Quite simply, they make it easy for anyone to leave a review – and even easier to help assure it’s a great one. Interested? You can learn more here. Want Adam to Speak at your Next Event?